Home » Happy Christmas from WaveLength! At this time of year, it can seem like everyone is happy with friends and family. But the festivities can make isolation even more painful for those who feel alone. 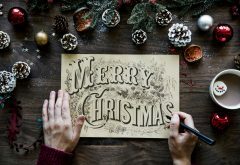 Millions of people in the UK are affected by bereavement, disability, illness or homelessness, and for them Christmas can seem like the loneliest time of the year. But for the thousands we have supported over the past twelve months, this one will be happier than the last. This year we have been fortunate enough to work with some inspiring individuals and organisations to fight loneliness. From homeless shelters to disability day centres, from refugee support workers to hospital Ward Managers. The people we have worked with are changing lives every day, and we are proud to help them in that work. And we couldn’t have done it without you. So on behalf of every WaveLength beneficiary, we want to thank you. In our end of year newsletter below, you can read about some of the projects we have completed this year, and hear from some of the people your support has helped. If you would like to receive a copy of InTune through the post next year, please let us know here! Finally, we will be working hard throughout 2018 to reach even more people. Thousands of people will still be spending Christmas alone this year, and we are committed to making sure that they won’t be lonely next Christmas. If you are able to donate to our Christmas appeal, please do so today. Even a small amount can help us change lives for the better. From all of us at WaveLength, have a very Merry Christmas.